It is a special honor for me to visit you as you approach another anniversary, the centennial of the May Fourth Movement, a proud moment in your history that demonstrated to the world a deep commitment on the part of young Chinese to the pursuit of truth―and a deep understanding of the power of truth to shape the future. Even now, President Cai Yuanpei speaks to us. “Universities are places for grand learning,” he said. “They are grand because they follow the general principle of free thought.” Under his visionary leadership, tremendous intellectual exploration and dramatic social change were unleashed. I join you today eager to learn more about one of the oldest universities in China―a university devoted to grand learning and free thought. My personal and professional travels have brought me to China many times. But it is truly extraordinary to experience this country and some of its great institutions as the president of Harvard University. Harvard and Beida share a deep and enduring commitment to higher education. We enjoy many strong connections and collaborations among our students and our faculty, who are generating knowledge that will change the world for the better―be it through art and architecture, through medicine and public health, or through engineering and environmental science. We should remember that that Cai Yuanpei not only led this university, but also helped to found the Academia Sinica, the Shanghai Conservatory of Music, and the China Academy of Art. His example reminds us of the power of both the arts and the sciences to elevate the human spirit and improve the human condition. Harvard has long looked eastward for expertise and partnership. In 1879, Mr. Ge Kunhua traveled from Shanghai to Cambridge with his wife and six children to become Harvard’s first instructor in Mandarin Chinese. The volumes he carefully transported to our campus were Harvard’s first books in any Asian language, and they became the original holdings of the Harvard-Yenching Library. One hundred and forty years and more than 1.5 million volumes later, it is now the largest academic library for East Asian studies outside of Asia―and the third largest of the University’s dozens of libraries. Among its many digitized collections are Chinese women’s writings of the Ming and Qing periods―an online archive that makes important materials from both Beida and Harvard accessible to scholars worldwide. These tremendous resources are used by some of the more than three hundred faculty across Harvard who study China―the largest group at any American university. These scholars and teachers deepen and strengthen understanding of Chinese culture, history, religion, anthropology, sociology, law, education, public health, public policy, and business. Last month, in preparation for this trip, I joined some of them for lunch to learn more about their diverse scholarship. It was nothing short of an intellectual feast, and I was reminded of the tremendous value of studying China in all its complexity and of sharing knowledge of China with the wider world. Of course, no one person can hope to accomplish as much as a team of people can. My university supports and amplifies the important work of our faculty through a variety of centers and institutes. 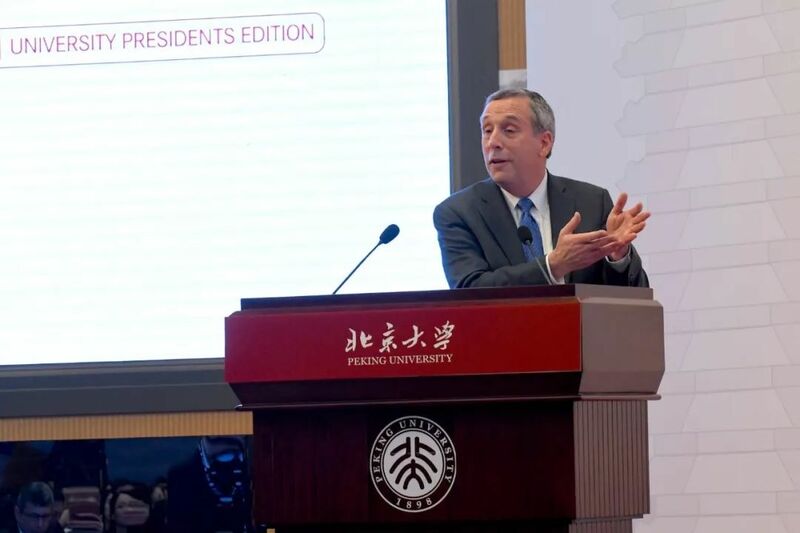 The Fairbank Center for Chinese Studies, the Harvard Asia Center, the Harvard China Fund: these initiatives have shaped how Harvard thinks about its engagement with China in every dimension―from teaching and research to exchange and collaboration. The oldest of these is the Harvard-Yenching Institute, which got its start right here on the grounds of the old Yenching University some 90 years ago, and which continues today to support the training of outstanding young Chinese scholars in every field. 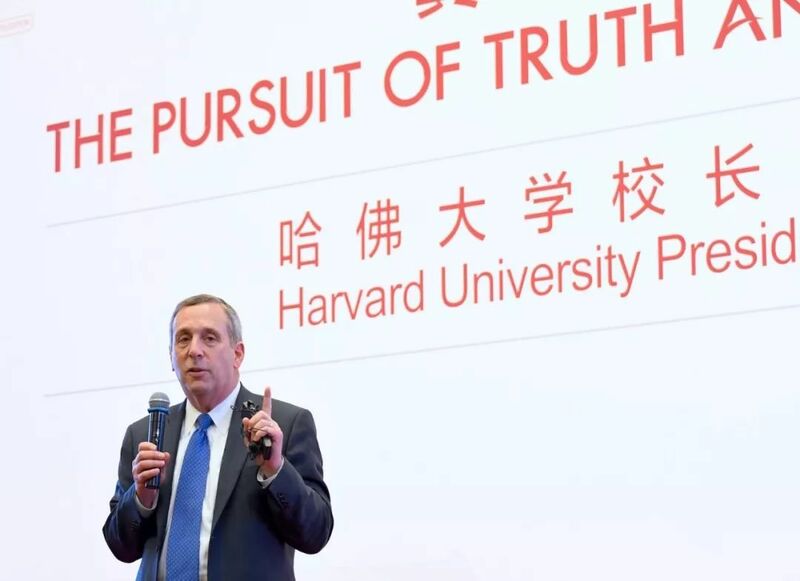 The Harvard Global Institute, the newest of our efforts, was launched four years ago to provide funding for small- and large-scale research projects, the majority of which are focused on China. Effective approaches and solutions to challenges posed by climate change, cybersecurity threats, and international relations will not be developed by a single university―or a single nation. Change and adaptation in these and other areas will require many people collaborating across schools, sectors, and societies, as well as governments. For this reason, how we choose to nurture human and intellectual capital at this moment is extraordinarily consequential. At Harvard, we welcome to our campus individuals from around the world who we believe will make meaningful contributions to our community and to the wider world. This year, over 1,000 students and more than 1,000 scholars have joined us from China―the largest cohort from any nation. They are learning and working in every School at the University. We also have more than 2,500 alumni who call China home. If Ge Kunhua were to return to Cambridge today, no doubt he would be gratified to see that there are many Harvard professors who, like him, were born in China and are now teaching at the University; he would also be pleased, I think, to learn that Chinese is the second-most widely studied foreign language at Harvard. The numbers and examples I have just shared communicate important and meaningful commitments, but they cannot fully capture what it means to be a member of a university community. Each interaction that unfolds, each relationship that blossoms on our campuses depends on both humility and hope―a willingness to say to others “I do not know,” to look in the same direction with them, and to imagine success―and risk failure―in the joint pursuit of knowledge. The work of discovery and innovation is messy and laborious. It requires creativity and imagination, but it mainly requires hard work. Excellence is never achieved easily―and nobody gets anywhere of consequence in this world on his or her own. I am also reminded of the first Pugwash Conference on Science and World Affairs. In 1957, as Cold War tensions mounted, twenty-two of the world’s eminent scientists gathered in Nova Scotia to discuss the development of thermonuclear weapons and the threat their use posed to civilization. Their collective work helped to pave the way for the Partial Test Ban Treaty of 1963 and the Non-Proliferation Treaty of 1968, among other consequential agreements. There were twenty-two attendees―seven from the United States, three from the Soviet Union, three from Japan, two from the United Kingdom, two from Canada, and one each from Australia, Austria, China, France, and Poland. Professor Zhou Peiyuan, a physicist and the sole Chinese member of the group, later became president of this great institution and, in 1978, led a delegation that arranged for scholarly exchange between China and the United States. We owe thanks to people like Professor Zhou Peiyuan for their farsighted and courageous leadership and for putting peace and mutual understanding above all other considerations. As I speak to you now, our governments are engaged in important and at times difficult discussions over a range of issues―and those discussions have implications that reverberate around the world. I believe that sustaining the bonds that join scholars across borders is of the utmost importance for all of us gathered here today―and for anyone who cares about the unique role that higher education plays in the lives of countless people. It is no wonder, then, that transformational thought and action often take root on university campuses. Overturning conventional wisdom takes a remarkable amount of grit and determination, as well as a willingness to welcome contrary views and to risk being proved wrong. Great universities nurture these qualities. They are places where individuals are encouraged both to listen and to speak, where the value of an idea is discussed and debated―not suppressed or silenced. If we stand for truth, we must appreciate diversity in every possible dimension. We must invite into our communities those people who challenge our thinking―and listen to them. Most of all, we must embrace the difficult task of being quick to understand and slow to judge. I have been president of Harvard for less than a year. In that short span of time, no less than half a dozen controversial issues have arisen on our campus, generating impassioned discussions―and even some spirited arguments and public protests―among students, faculty, and staff, as well as alumni and friends of the University. Such arguments can cause discomfort. But they are signs of a healthy community and of active and engaged citizenship. In fact, it would be unusual and, frankly, unsettling if a semester went by without any episode of disagreement. When conflict does arise, it forces us to ask: What kind of community do we want to be? And that question sustains and strengthens us―and enriches our search for truth. In many circumstances, my role as president is not to define the “correct” position of the University but to keep the channels of discussion open. From a distance, Harvard can appear to be a place that speaks in one voice. It is, in fact, a place of many voices. And one of the most important―and most difficult―of our tasks is to ensure that all members of the community feel empowered to speak their minds. I am often asked to share the secret of Harvard’s excellence. Whatever we accomplish, we accomplish with the help of others. Without the world’s other excellent institutions of higher education to challenge and inspire us, without others to learn from and work with, we could not be nearly as successful as we are. The United States alone is home to some four thousand colleges and universities, and they are remarkably diverse. Some are devoted entirely to undergraduate education, others to undergraduate, graduate, and professional studies. Some are focused on a single academic area―art or music, for example―while others advance a wide variety of fields and disciplines. Each of them competes for talent and resources; all of them look to one another for examples of where and how they might improve. Along with HarvardX courses, such students take PekingX courses that have covered everything from folklore, grammar, and music to drug discovery, nutrition, and robotics since Beida joined our effort in 2013. You have reached hundreds of thousands more people than you would have otherwise. Sharing the riches of learning more broadly is one of my aspirations for Harvard and for all of higher education. Our excellence can―and should―help to make the world better for individuals who may never set foot on our campuses. Harvard University and Peking University are on the same road together. We will continue to seek meaning and grace through relationships created and nurtured by our faculty and our students. May we continue to learn from one another and grow in knowledge and wisdom. Thank you, again, for welcoming me so warmly today. It has truly been an honor―and my pleasure. May our dialogue joyfully endure.